DAN'S VINTAGE GIJOE INFOSITE - "VINTAGE GIJOE DATABASE"
"A BEGINNING TO THE VINTAGE GIJOE DATABASE"
It is about time to finally start this database. This page is a starting point to finally making a checklist of everything ever made for vintage GIJoe by Hasbro from 1964 through 1969. This checklist and the ones to follow will be for everyone's benefit AS A COLLECTOR. The following checklists are for your own personal use only! If you are making a website or writing a book or just blogging then YOU DO NOT HAVE MY PERMISSION TO USE THESE CHECKLISTS. If you are going to start collecting vintage GIJoe then you will probably buy a Joe or 2, grab some uniforms and accessories and put them on a shelf. Congratulations, you are now a vintage GIJoe collector. O. K., now what do you do? That is how everyone starts but for some reason there are no checklists or guidelines to get you moving forward on your collection. How can you travel down a long road without a map? How do you know where the road starts or ends? How do you find out if you have visited every important place or seen all there is to see? A good starting point for a vintage GIJoe collector would be for them to ask a good question: If I wanted to collect every vintage GIJoe outfit how many dressed GIJoes would be on display at the end? I have asked several people this very question and nobody had an answer. 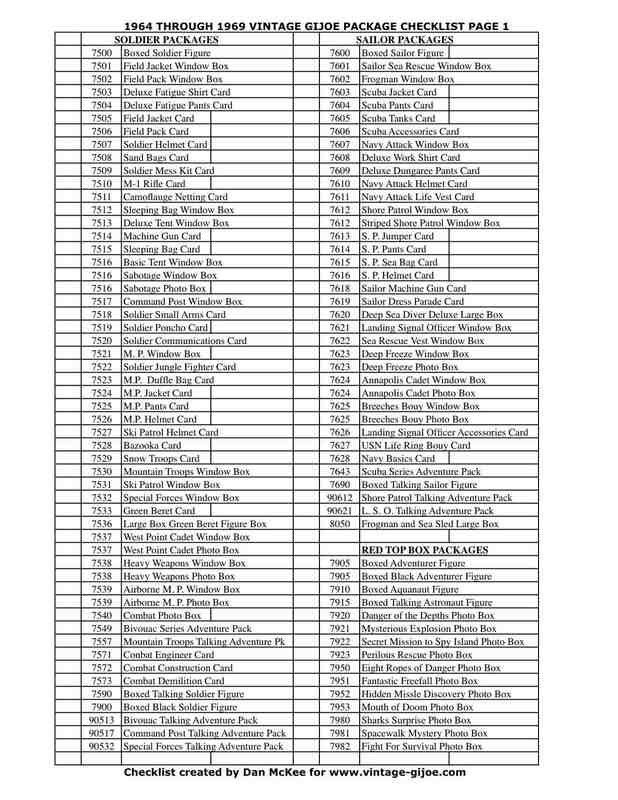 I have compiled a list of every 1964 through 1969 uniform set and my first answer is 80. I reserve the right to change my mind and the list at some point if necessary. The following vintage GIJoe checklist does not include every variation that you might find. The list includes at least one of every GIJoe that you could display if you wanted a "one of everything" collection. A collector can use their imagination to completely outfit several of the GIJoe's in their displays. For example, the Bivouac Joe might include a sleeping bag OR tent on a field pack and it might have a Field Jacket and helmet too. There is no right or wrong way to collect, just as long as you collect true vintage GIJoe by Hasbro. CLICK HERE TO DOWNLOAD THIS FILE AS A PDF FOR YOUR PERSONAL USE ONLY! If you start collecting vintage GIJoe then you may want to try and find all of the sets in their original packages. This sounds like a great idea and is exactly what I tried to do back in 1996 or so when I went to my first vintage GIJoe show. I actually saw several of the old packages for sale and some of them were very affordable. I grabbed one that was $40, the Sailor Scuba Accessories card. Now that I had one, could I find more? How many more of them were there? Is there a checklist or complete listing of everything made? How could every book ever printed on GIJoe leave out such critical information? Alas, there was no list anywhere back then and there STILL is no checklist of every package ever made for vintage GIJoe from 1964 through 1969. That is, until now! 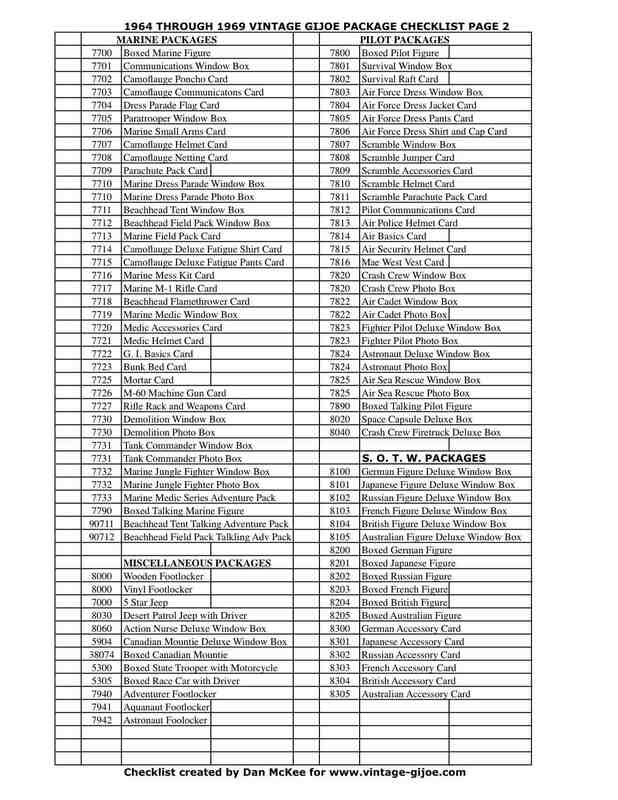 There are 204 different vintage GIJoe packages you could collect or 199 packages plus 5 footlockers. The following vintage GIJoe checklist does not include every variation that you might find. The list also does not include salesman samples or prototypes. I will make a separate list of the known salesman sample packages later (I have some VERY impressive evidence on this topic). There are several iterations of most packages and even the contents of each package may change slightly from one version to the next. 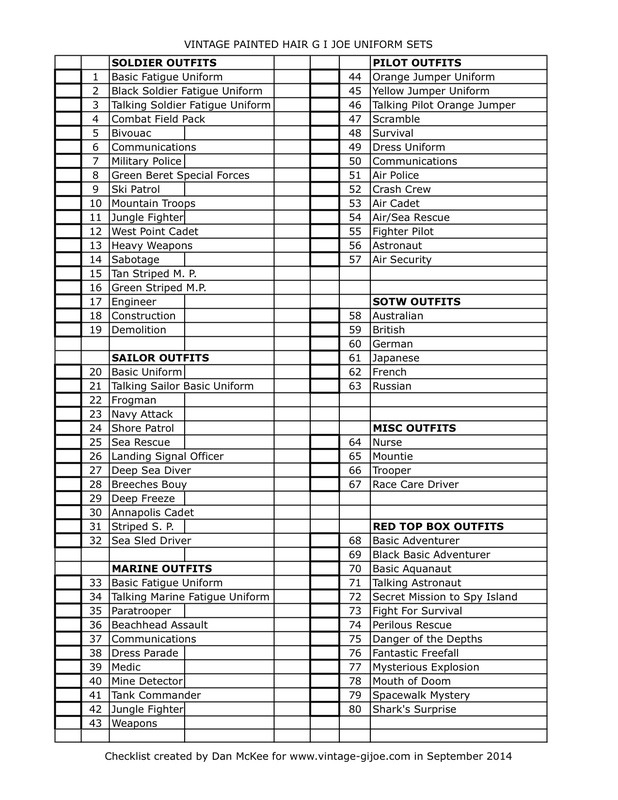 This 2 page list includes at least one of every vintage GIJoe package that you could display if you wanted a "one of everything" collection. There is no right or wrong way to collect, just as long as you collect true vintage GIJoe by Hasbro. ALT or SHIFT CLICK HERE TO DOWNLOAD THE FIRST PAGE OF THE CHECKLIST FILE AS A PDF FOR YOUR PERSONAL USE ONLY! ALT or SHIFT CLICK HERE TO DOWNLOAD THE SECOND PAGE OF THE CHECKLIST FILE AS A PDF FOR YOUR PERSONAL USE ONLY! I promise to come up with more helpful checklists for all vintage GIJoe collectors to use very soon. Some of the checklists to come will be for all window boxed sets, all carded sets, all photo boxed sets, all large boxed sets, all vehicle sets and all special value packs. The most important checklist to come will be the hardest one to compile, the every variation of every item checklist. Keep checking back for future updates.